Do you know what a duvet is? We follow a path outwards from the “fear center” of our protagonist's brain, moving through various cerebral micro-landscapes and exiting a skin pore, gracefully ending between the sights of a Smith & Wesson 4506 pointed into his mouth. Realized by VFX house Digital Domain under the direction of Kevin Tod Haug for David Fincher’s post-punk soliloquy, irreverence and lack of context are perhaps this sequence’s greatest assets, aided further by a mash-up Dust Brothers score cranked to 11 and a rave-flyer-inspired sans serif typeface designed by the late P. Scott Makela. 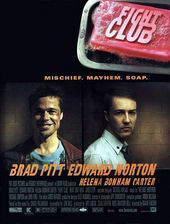 With Fight Club, the whole thing could have started with the sound of a gun being cocked, opening on Edward Norton — which is how it began in all the preview screenings — but I had this idea to begin with the electrical impulse of information between two synapses to cue the fear or panic receptors in Edward Norton’s character’s brain. Then we literally pull back, changing in scale all the way back, and we pull out through his forehead. Now, did we need that? No, we didn’t. We probably spent $750,000 or $800,000 dollars on the title sequence. So to go to the studio and say, “Hey, this could be a really good idea. We’ve already seen the movie with the sound of a gun cocking and it works pretty good. But this… this will put asses in seats!” — it’s a gamble. They don’t see it that way. So it’s a minor indulgence, but I remember that stuff. You’re not shy about exploring the potential of the title sequence. Yeah, it’s fun. Why wouldn’t it be? Actually it’s funny, when I finally saw Enter the Void… one of the things we tried to do on Fight Club was to literally flash the credits. I wanted to burn them, sear them into people’s eyes, and have them on screen for like four frames and then let them decay away. Needless to say, when we ran that past the guild it didn’t go over well, and I was so mad when I finally saw Enter the Void! I was like, “That’s the thing to do!” Here it is: it’s a jackhammer to the middle of your forehead — your third eye. Though the director had always intended to open the film in this fashion, budgetary concerns had kept the title sequence from being awarded until January 1999 – leaving Digital Domain with a fairly short turnaround time for producing the ninety-second shot. Fincher and [Kevin Tod] Haug had instigated extensive previsualization early on, enlisting the assistance of medical illustrator Kathryn Jones to develop the brain trip with ridefilm-like action, and utilizing PLF for the later part of the shot, which emerges on the surface of the narrator's face and tracks back to reveal a gun. "Kathryn put together a whole book of illustrations for us," Haug noted. "She also made up a map that showed all the various 'rooms' of the brain and the 'doors' that open onto them. From a scientific point of view, she clued us into the fact that the brain was basically colorless, which fit David's monochromatic intent. But he made it tough on her design-wise. While he wanted to keep the brain passage looking like electron microscope photography, that look had to be coupled with the feel of a night dive – wet, scary, and with a low depth of field." After extensive consultation with Dr. Mark Ellisman, professor of neuroscience and bioengineering at the U.C. San Diego School of Medicine, Digital Domain wound up departing from the initial shot design, mainly to boost visual interest. 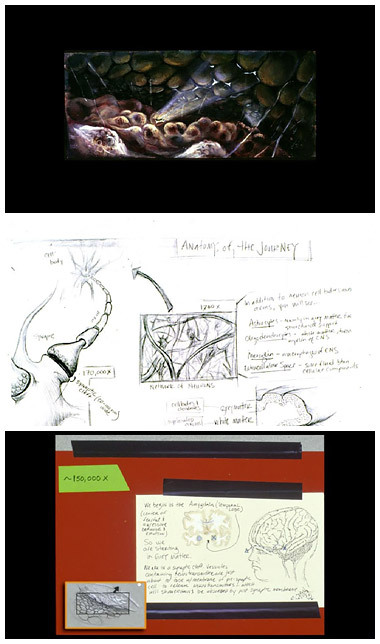 "We decided to change some areas of the brain being shown," noted DD visual effects supervisor Kevin Mack, "but the overall cinematic concept remained the same. The camera would always be pulling back; and we treated the shot as though there were an actual physical camera moving through this tiny space." To help convey the notion of an actual camera filming within the brain, a shallow depth of field - achieved via ray tracing - coupled with a roving focus, was utilized. "We choreographed events to pass camera in as interesting a way as possible," said Mack, "which meant animating this shallow-focus focal plane. If something of particular interest passed, the camera follow-focused on it for a time before racking away to some new object, directing the viewer's eye to the next area of interest." The camera pulls out of the brain through the skull, passing fat cells and entering a skin pore. Then it emerges onto the narrator's face by exiting a hair follicle above the nose… Descending past the upper lip, the camera retreats from the narrator's face and enters metallic-looking groove - pulling back along the length of what turns out to be the sight of a handgun. The CG pullback ends at the weapon's rear sight, with DD creating a transition that blended its digital scene with production's live-action rack-focus, which begins on an oversize gunsight and winds up on Edward Norton's profusely sweating face. PLF's previz for the camera track-back along the gunsight proved so reminiscent of the Death Star trench from Star Wars - one of the director's favorite films - that a joke version of the animatic was produced, with a pair of TIE Fighters popping up to chase the camera. The first time we showed [Edward] the rough tests of this he was like, "My face is not that dirty!" And I said, "You know that this is all based on actual photographs of your skin." Want to find out more about the films and title sequences of David Fincher? Be sure to read our feature interview with the filmmaker in David Fincher: A Film Title Retrospective.